Dhrupad is the oldest form of vocal and instrumental music in the Hindustani tradition that is being practised even today. It is first mentioned as a fully evolved form in the late 15th century musical treatise Man Kutuhul compiled by the scholar-musicians of Raja Mansigh Tomar's court in Gwalior. Strict adherence to the architecture of the raga, respect for the tala or beat cycle in a given composition, and organic or natural attainment of Bhava are an absolute must. Emphasis is laid on tonal fidelity. The Dhrupadia, unlike the exponent of khayal and related music, does not have at his command a dramatic device like the taan (roulade) rendered at various speeds and volumes. He must express himself through single notes that are clear, sustained, soft, sharp or flat and those that glide (meends) or vibrate (gamaks). Masters achieve intensity and equilibrium through judicious use of shruti or microtones in their musical explorations. Bihag is a late night raga which omits the Rishab & Dhaivat in ascent and uses all seven notes in the descent. The origin of this raga is in the parental scale Bilawal. It has the Gandhar as its vadi (dominant note) and Nishad as samvadi (sub-dominant). In this raga the combination of Nishad with Pancham and Gandhar with Shadaj is taken with meends. Tivra Madhyam is used as a vivadi (contrasting note) to add just that overwhelming element of Shringar Rasa (romance). Uday Bhawalkar starts his alap very slowly using syllabli taken from an ancient Sanskrit mantra. This meditative treatment develops the emotional state of the Raga phrase by phrase in three movements called the alap, jod and jhala. In the jod and jhala portions the speed of the alap gradually increases and employs a Rhythmic pluse, which builds up to a point where the melodic patterns literally dance in space. The abstract alap is followed by a composition “Tum kahan se mad" is set to Dhamar Tala which is a rhythmic cycle of 14 beats. The intricate patterns and improvisations woven by, the Pakhawaj player and the singer, to express the playful mood of the song text. 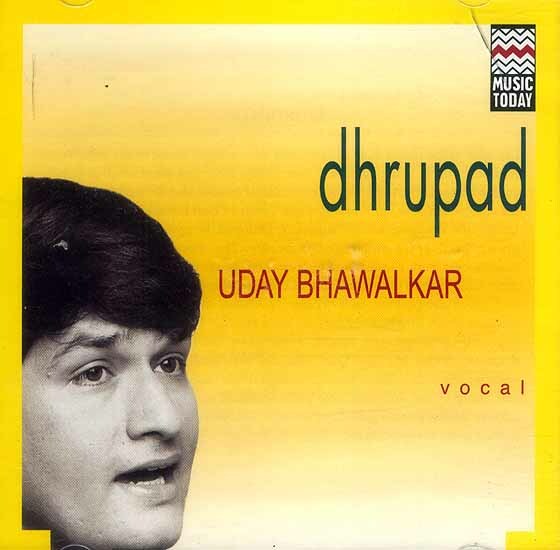 Born in Jaora, Madhya Pradesh in 1966, Uday Bhawalkar started learning music at the age of eight from his sister at home and latter in a local music school from 1975 to 1981 he received a four year scholarship from Ustad Allauddin Khan Sangeet Academy, Bhopal, to study Dhrupad in the traditional 'Guru- Shishya Parampara' under Ustad Fariduddin Dagar. Later he continued his training under his Ustad Zia Mahiuddin Dagar the renowned Veena maestro. One of the most talented younger exponents of this old musical form, Bhawalkar has taught and performed widely in India, the United states and Europe.